Somewhere along the line, in the very modern pursuit of making everything instantly accessible, we fell out of love with the idea of craft, with the notion that something created with love and care has a greater value. Mass consumerism was taken to another level with the advent of the internet – literally everything became available at the click of a button, instant gratification at our fingertips. Nowhere was this more evident than in the music business. The process of making and releasing music went from a multi-stage process where creative input was required on many of the steps along the way to an accelerated operation that eventually spews out music as a stream of bits and bytes, recorded, distributed and promoted in the digital world. We all benefit from the readily available, instant access to the music we like but what do we lose? What have we traded in to get to this point? A few days ago, a package arrived in the post. Inside was an album from a Dublin musician who I have never met, but know through various exchanges on Twitter and Facebook. From our brief and infrequent online interactions, I know Pat Barrett to be someone who is passionate, knowledgeable and opinionated about music. I also knew that he had been working on this album for some time. It was obviously a labour of love for him but nothing I knew could have prepared me for the fruits of that labour, a beautifully luminous surprise on a cold January day. 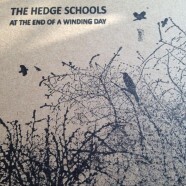 At The End Of A Winding Day by the Hedge Schools comes wrapped in a gorgeous, simply designed cardboard sleeve; before a single note is played the packaging screams craft, love, care. You know instantly this is an album made by someone who cares passionately about what they do. Usually it’s around this point in a review when I start picking out highlights, say a few words about individual tracks. But it seems almost churlish to single out tracks on an album like this. All I will say is that the music has a warmth, beauty and serenity that place Pat Barrett and The Hedge Schools in rare company indeed. The songs seem to be inspired by the music of Talk Talk (circa Spirit of Eden), The Blue Nile and Paul Buchanan’s solo work. There are faint traces of the ambient classical beauty of Nils Frahm and Olafur Arnalds in there also. Produced with a lightness of touch by Joe Chester, it is a record that knows the value of space and silence; there is a total absence of clutter and distracting, superfluous noise. The music and lyrics convey the image of a song-writer at peace with himself; there is no trace of the whiney, tortured artist here, just a sense of contemplative wonder and respect for the simple pleasures to be found in life and the world around us. At The End of A Winding Day places Pat Barrett and The Hedge Schools at the vanguard of Irish musicians (with the likes of A Lazarus Soul) who are making a difference by their dedication to the ideal that music is worth caring about. In an industry that continues its steep decline, where the creative output of artists and musicians continues to lose value, perhaps a record like this might serve as a blueprint for a way back. It may be an idealistic notion, but the concept of a record as a crafted gift, of something that is produced and presented to the world in a unique, personalised way has to have more appeal than a bunch of files downloaded on to a computer. Idealistic or not, it is a notion that those of us who are fervent about music might consider. At The End of a Winding Day is an album to treasure – do yourself a favour and let this record into your life.